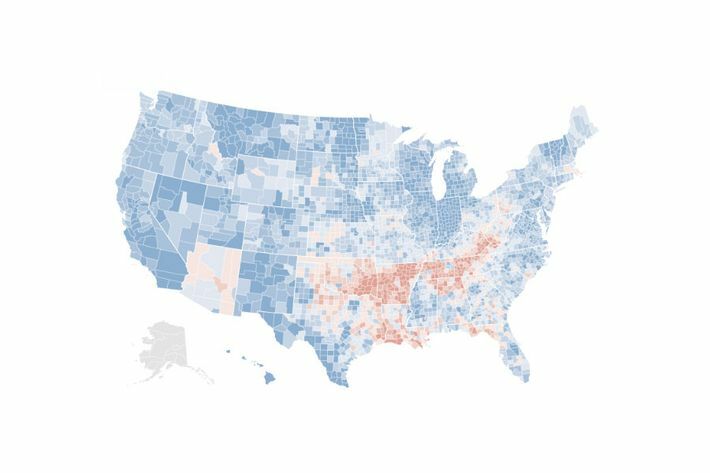 Why Do Appalachians Love Clinton and Hate Obama? While President Obama’s approval rating in Kentucky is in the mid-30s, Bill Clinton — with his southern roots and love of college basketball and horse racing — is popular in the Bluegrass State, which he carried in both of his presidential elections. That’s why Clinton runs so far ahead of Obama? Horse racing and college basketball? 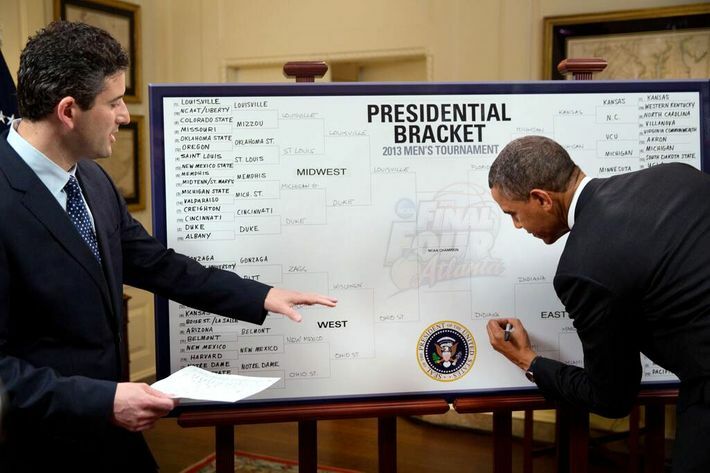 Obama loves college basketball. He makes a huge public show of it, filling out his bracket every year on national television and granting interviews during the NCAA tournament. 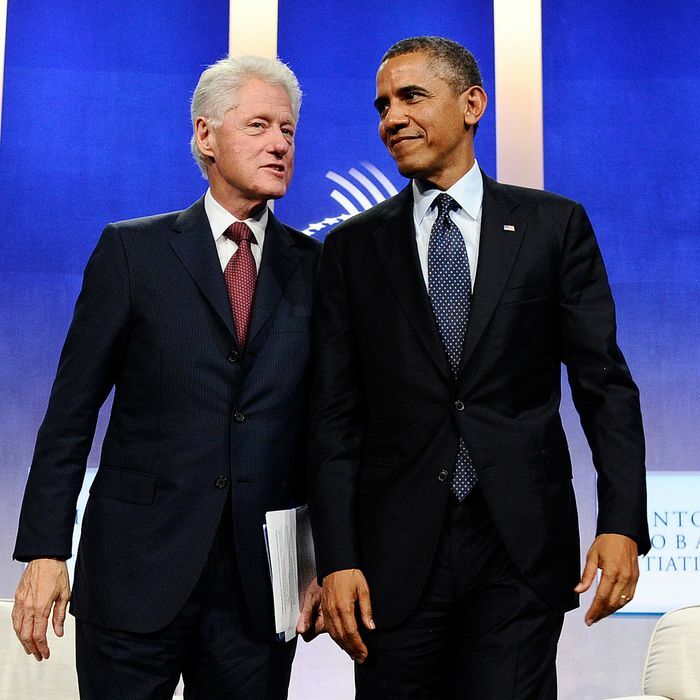 One reason for Clinton’s popularity is that all ex-presidents tend to gain favor as they recede from the partisan infighting of day-to-day politics and position themselves as revered elder statesmen. But the other reason Clinton could always compete in Kentucky while Obama never could is one that does not appear anywhere in the Post story: race. Six years ago, in the midst of a still-heated contest for the Democratic presidential nomination, George Packer traveled to Kentucky, where voters there registered surprisingly candid reasons for their support for Hillary Clinton over Barack Obama. The mere fact that Kentuckians would endorse Clinton (whose base within the Party leaned heavily on the white working class) was the opposite of surprising. What shocked about Packer’s report was, first, the explicitly racial tone of the opposition. Voters were not bothering to couch their disdain for Obama in euphemisms about affirmative action or crime or even Jeremiah Wright. They were saying things like, “I think [Obama] would put too many minorities in positions over the white race.” Nearly as surprising was the fact that, despite such beliefs, they were willing to vote for Democrats anyway. I suppose you could attribute the difference to “culture,” with Obama representing elite academic urban America, but it’s not as if Kerry cut the figure of a prototypical Regular Joe. The difference is also hard to explain via other easy regional touchstones, like guns or coal, given that Obama was no more pro-environment or anti-gun than Kerry, and his opponent, John McCain, was hostile to the NRA and favorable to cap and trade. It’s hard to come up with any explanation to rival what Packer found — race. “We are still a racist state, I hate to admit it,” says the Kentucky GOP strategist. “Anything you can connect to Barack Obama is a winning thing for us.” Or, as a prominent Kentucky Democrat puts it: “The only way they can beat [Grimes] is to paint her skin a different color than it is and make her gender a different gender than it is. They’re going to have to make her Barack Obama. If you're the unnamed Kentucky GOPer who told Politico we're "still a racist state," gimme a call. Like to know who I'm cussin' at. And to be sure, Kentucky is not a “racist state” in the sense that everybody in it is racist. But race is a central dynamic, and the outcome of the election will turn in large part on whether Grimes can appeal to white Democrats who don’t want to support an African-American. (Probably many of these voters are the same ones who love the state’s new health-care law but hate Obamacare.) It’s also a reality that is too uncomfortable for many observers to actually state.